Former President Olusegun Obasanjo has reacted to reports in the media that he held a meeting with Vice President Prof. Yemi Osinbajo at his Ota Farm, Ogun State, on Wednesday. 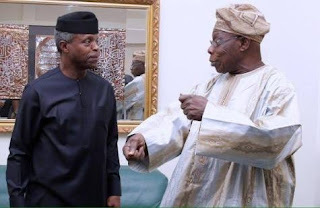 Reports circulated during the week of a meeting between Obasanjo, Osinbajo, and the Minister of Transportation, Rotimi Amaechi. But in a statement signed by his media aide, Kehinde Akinyemi, on Friday, the former President said the report was false. “It is a fact that severally, the former president has dissociated himself from owning any social media account. “Therefore, it is highly disappointing that such sensitive Twitter post would be allowed to go on air without verification by the African Independent Television (AIT),” the statement stated. Obasanjo further urged the media to always be professional in discharging their duties and to refrain from creating unnecessary confusion and heating up the polity. He added, “There was no meeting with the Vice President anywhere. I was at the airport and was informed that he was around in the lounge and out of courtesy; I felt I should go and greet him. We met, greeted and exchanged pleasantries and I left. That was all.